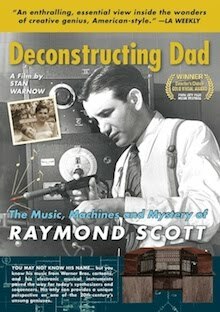 Over the years, Raymond Scott has been jeered by jazz purists because as a bandleader he didn't permit improvisation. Actually, original RS Quintette saxophonist Dave Harris (1913-2002) told Storyville magazine's Ben Kragting, Jr., in a 1993 interview: "Although Scott did the composing and arranging, he never suggested what to play on the jazz. That was up to you. But what you did was fit the jazz within the character of the tune." In a phone conversation with me around that time, Mr. Harris added that once you created a solo that Scott liked, he insisted that it stay that way, thus becoming an intrinsic part of the composition. In this sense, Scott's works are more through-composed than most of what qualifies as "jazz." Listening to countless takes (and re-takes, ad infinitum--Scott liked to rehearse!) in the archives, I can attest that many solos evolve and become set, although few are note-perfect identical (a superhuman feat). Jazz listeners--fans, critics, historians--seem always to have resisted accepting, even understanding, such practices. From earliest days, the romanticized view of hot music has demanded that a solo be wholly extemporaneous, creation of a given moment's circumstance and stimuli. For many, the thought of a player working on a chorus over time, shaping and buffing it, then performing it like a theatrical set-piece, each time with the enthusiasm of first creation, seems profoundly disturbing. Some have been inclined to view musicians who practice such methods as not genuine, their creations at best a simulation of "the real thing." The attitude differs little in kind or effect from the Rousseau-esque ("noble savage") primitivism once prevalent among fans and canonists of early New Orleans music; any musician who had studied his instrument, it seemed to say, or knew harmony, or could even read music was somehow contaminated, less authentic than his unlearned colleagues. "Routining" came about for reasons intrinsic to the mechanics of professional music-making. Having to play nightly, sometimes repeating the same number, in the same arrangement, several times in an evening, can quickly sap inspiration. If the player is a featured attraction or bandleader, it becomes all the more necessary to deliver, each time, an inspired and convincing performance, easily recognizable as his work. The result, inevitably, is a distillation, gradual creation of a generic solo which, when completed, contains the player's essence. Recording exacerbates the process. The need, in a studio, to deliver a quality performance for the microphone, the chance that any one of a number of "takes" will be chosen for issue, exerts pressure to have something ready--even though that something may not, strictly speaking, be improvised on the spot. Once in place, it is subject to infinite variation; but the shape and structure remain. If the player is feeling especially inspired he will take liberties; if not, he can still deliver the "routined" solo with appropriate elan and pass muster. Neither false nor dishonest, this is an expedient, born of the conditions under which hot musicians of the '20s and '30s had to work. 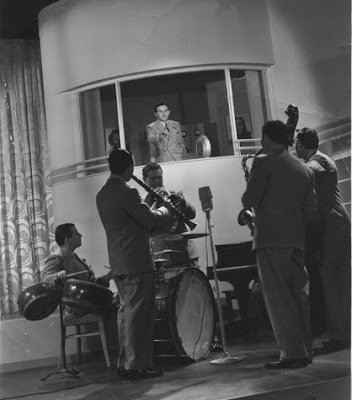 Multiple takes from famous record sessions, some issued years after the event, reveal that [Bix] Beiderbecke, [Frank] Trumbauer, Louis Armstrong, Coleman Hawkins, Lester Young, Adrian Rollini, Jack Teagarden, Harry Carney, and Bunny Berigan were among many others who worked oft-featured choruses into fixed shape and kept them there. 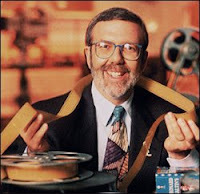 Long recognized as one of the foremost American film critics and historians, celluloid über-fanboy Leonard Maltin has long been a Raymond Scott enthusiast. He recently picked up the new RS Quintette CD Ectoplasm and declared it "delightful to listen to." The CD, we should point out, has not been maltinized in any way. 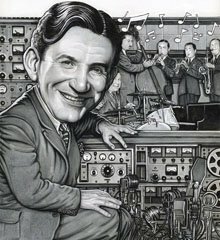 "Famous Young Maestro & Composer of Modern Music"
THE CHICAGO DAILY NEWS published this not-so-flattering caricature of Raymond Scott, drawn by Roy C. Nelson, when Scott's orchestra swung at Chicago's Blackhawk Restaurant in 1940. Thanks to illustrator & animation designer Shane Glines (Spumco, Warner Bros. Batman, Superman.) of CartoonRetro.com ("home to the world's largest online archive of vintage illustration, animation, comics and cartoons") for archiving this curio.